Summon: Give other friendly Spriggans and Animals +2/+2. Shadowgreen Elder is an epic Agility creature card. It is part of the Heroes of Skyrim expansion. This card's summon ability applies the Elder's Gift card effect. 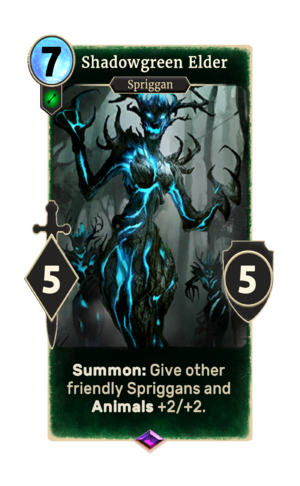 This card is named after Shadowgreen Cavern in Skyrim. This page was last modified on 24 September 2018, at 23:16.